Coco "Yellow Pearl Mermaid Princess"
Mermaid Princess of the South Pacific Ocean and keeper of the yellow pearl. She is incarcerated by the sea monsters for most of the first season, so not much is known about her. In the manga, however, she is a friend of fellow Mermaid Princess Sara. Later, she is found to be playful and gentle in the manga, yet brash and outspoken in the anime. 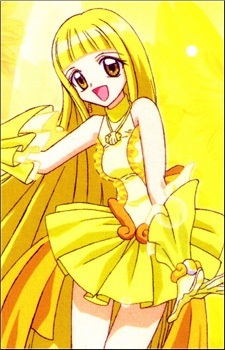 Her idol form is Yellow Pearl Voice.